By purchasing services with Dumpster Rental Services, Myrtle Beach (Contractor) you agree to the full terms and conditions stated below. You must call 843-459-7281 directly to insure cancellation or change to your service. ACCEPTANCE AND USE OF THE CONTAINER CONSTITUTES ACCEPTANCE OF THESE TERMS AND CONDITIONS. The “Customer” agrees to indemnify, defend, and save Dumpster Rental Services, Myrtle Beach harmless from and against any and all liability which Dumpster Rental Services, Myrtle Beach may be responsible for or pay out as a result of bodily injuries (including death), property damage or any violation or alleged violation of the law to the extent caused by “Customer’s” breach of this Agreement or by any negligent omission or willful misconduct of the “Customer” or its employees, agents, or contractors in the performance of this agreement. Neither party shall be liable to the other for consequential, incidental, or punitive damages arising out of or in connection with the performance or non-performance of this agreement. Every contracted dumpster rental includes both a disposal allowance (noted on the order confirmation and initial invoice) and a rental period of _____ days. After the final removal of a container, or the interim removal of multiple containers at one location, a weight will be recorded when it is taken to a disposal facility and emptied. Weighing the container is done on a scale. The weight of the refuse is determined by subtracting the weight of the container and of the truck from the total weight registered when the truck passes over the scale. 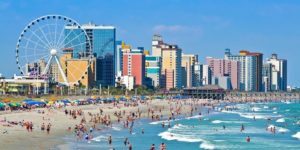 At the point the weight of the refuse is reported to Dumpster Rental Services, Myrtle Beach, an additional invoice will be generated for any excess weight over the allowed allowance. If the container has not exceeded the initial disposal allowance and the container was not held longer than the _____ day Dry rental period, no additional charges will result. Please refer to the attached order summary for a listing of additional charges you may be liable for. If the customer would like to cancel the order, they must do so by calling our customer service department during our Normal Business Hours (Monday – Friday, 8AM – 5PM EST, excluding Holidays) at 1-843-459-7281. Cancellations attempted after 5:00PM, during weekends and major holidays are not recognized until the next BUSINESS DAY. Cancellations confirmed within (1) business day of the scheduled delivery date will result in a fee of $100.00. Cancellations made after the container has been dispatched will result in additional fees, including, but not limited to: trip cost, fuel fees, tolls and any other costs incurred by Contractor as a result of the disruption.